I haven't known much about this rather secluded place until I made a fly by with Brian and his RLU-1 Breezy Experimental aircraft. Even then, I haven't paid much attention to it until a local resident who calls it home gave me some tidbits about it and was even invited to his birthday party which would take place there. He owns a condo that is the Makaha Beach Cabanas which stands tall right along the beach front. Upon arriving there, I was surprised that such a wonderful place went unnoticed on my radar for this long. I was in for a treat! The party itself was a real good turn out with many people showing up. Even Wayde Fishman of "Wayde's World Hawai`i" was there. But he wasn't to film or document anything. He was there to celebrate the Birthday Boy and just have a good time. I wanted to take the opportunity to document it as there was a little known hiking trail that reaches for the top of what the locals call "Black Rock", a large rocky stand alone ridge that is oddly next to the ocean. After settling and exchanging pleasantries with people who were there, I set off. I made my way down the beach and picked up an old 4x4 dirt road that heads mauka along the base of Black Rock. A local guy off the side of the road greeted me and I did the same in return. It wasn't long before I spotted a trail heading up the side of the rock formation and up I went. Looking halfway up, I could make out a mother and 4 kids doing the same route. The climb isn't difficult at all, much of it can be walked albeit a couple of mild scrambles. I didn't have my hiking shoes with me so "slippahs" (flip-flops) it would be. Before I knew it, I was already on the crest and the views opened up to the south. Dominating high above me off in the distance were the Wai`anae Mountains and the leeward coast of Wai`anae and all the way as far as Ko`olina were clearly visible to the south. The views to the north were obscured by Kea`au Ridge, a massive ridge line that connects to the ridge to the north, `Ohikilolo Ridge. From here, the top is easily acquired by merely walking less than 5 minutes along the crest to reach a cemented metal pole, passing by a couple of Kiawe trees. It appears that someone has erected a Hawaiian Flag which was only secured to this pole by choke (a lot of) industrial tape! The views from here are spectacular. The entire Makaha Beach Cabanas and it's beach lay below, along with the bluer than blue waters. Looking directly to the west is nothing but a deep blue Pacific Ocean. Not many ridges take you so close to the ocean as this one so it makes for a unique perspective of the coast line. This also makes an excellent location to view the sunset as I would do later on this day. But for now, I wanted to explore what would be the highlight of this small little hike. The plan called to continuing makai along this ridge and see if a descent can be done. 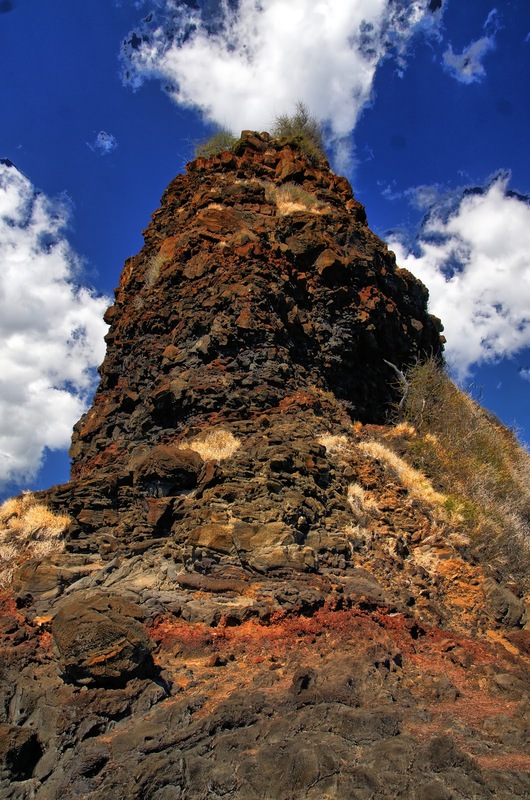 I've read and heard accounts of people ascending and descending a short but very steep bouldering section that lies on the makai facing side of Black Rock. As I was about to push off, I heard voices from behind and noticed the same mother and kids I saw earlier popped out into view. I said my aloha to them and offered to take their picture of them on the summit and then they departed back down the way they came from. I proceeded makai and encountered numerous Kiawe trees with it's razor sharp thorns protruding in every direction. Some of these trees took up the entire width of the ridge which made for slow progress at times. Since I was doing this in slippers, my foot was exposed to these thorns. At some point, I felt a severe sharp pain and looked down to find that indeed one of the thorns from a fallen branch has punctured my foot. And I saw the damn thorn pierce even deeper as I placed my entire weight. I yelped in pain and somehow made it past the tree to a clearing. Blood began flowing and the pain was relentless. I highly recommend shoes for this portion. After tending to my wound for some time, I proceeded onward and the ridge began a gradual descent towards the deep blue ocean, bottoming out at the area that makes up Lahilahi Point. After going down some ledges, the angle of descent steepened abruptly and I can see where the bottom was. 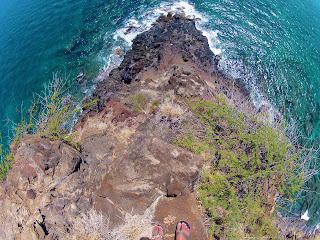 I carefully made my way down, bypassing yet another Kiawe tree on my right. Just after this tree is where the angle of descent is at it's steepest and it goes down for maybe about a little less than 100ft. Fortunately, there are plenty of holds to use. Unfortunately, a lot of these holds are not sturdy at all. In fact they can look deceiving to the unwary. Testing each hold is a must or you risk of making your descent via express! Going down proved tricky for me as I have a habit of descending steep things facing forward. Having your back towards the ocean is probably your best bet but it's very steep that you have to feel your way downward with your feet. Testing each hold is crucial here. Eventually I reached the bottom, proceeded to head to the farthest point to the coastline, and looked back up to see how it looked bottom up. Doing an ascent on this makes for some bouldering fun but make sure to test those holds! I made my way back to the beach area via a trail that skirts the base of Black Rock on it's north side. There are a few heiaus in this area so please make a mental note to not disturb these areas. This is a short and fun little hike to get a better vantage point of Lahilahi Point and the Makaha Beach Cabanas. 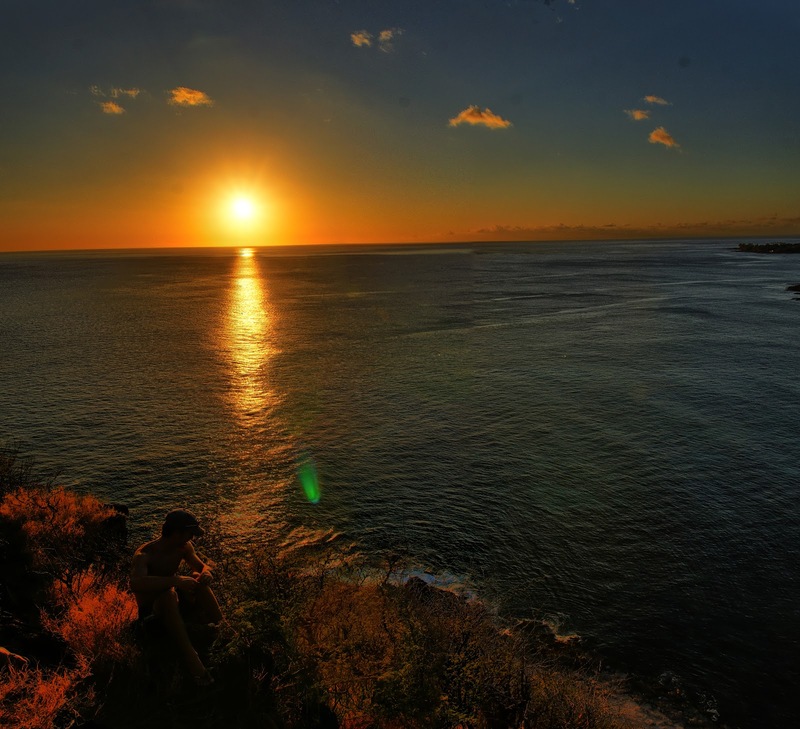 Heading up the mauka side only takes 15 minutes or less and a quick way to catch that perfect sunset! I definitely recommend shoes for the summit section past the cement pole and the makai side! Disclaimer: Many of the hikes mentioned on this blog are for entertainment purposes only and should not be used as a guide. These hikes are off limits due to unsanctioned trails / dangerous conditions / private & government property / overgrown conditions / lack of a trail / etc. Please refer to the Na Ala Hele website, which maintains the State of Hawai`i trails, for public hiking information. These trails are open to the public, well marked, and maintained. Upon writing each blog entry, the information I've gathered from each of my hiking experience is outdated (a rock slide has changed the landscape, a rope is installed or taken down, land owners restrict or grant access to trails, etc.). Please take this into account, especially on the older blog entries. What you've read on this site may not necessarily be there on the day of your hike. DGC will NOT be responsible for any damages, injury, or loss due to the use of information, or participating in such activities that are mentioned on this site or any other site that belongs to or is affiliated with DGC. All blog entries, photos, and videos unless otherwise stated are the property of David G. Concepcion and may not be used without permission. Mahalo. ©David G. Concepcion. Blog best viewed at 1440x900. Powered by Blogger.